At Forward Slash Technology, we offer a number of hosting solutions for small and mid-sized businesses throughout the St. Louis area and around the country. These include colocation services which will allow your organization to host your data in a secure, offsite location. Our colocation data centers are equipped with the space, power, cooling and physical security which your information needs. We have high bandwidth facilities that save you on space, equipment and human resources. By using colocation services, you will only pay for the amount of resources you need and use. To learn more about our colocation services and cloud hosting services available to businesses and to determine if either of these hosting solutions is right for your business, please contact our IT company. Colocation is a hosting option for small and medium sized business who want the benefits and features of large IT departments without the high costs. Colocation services include moving your server to a different location outside of your main office. When utilizing colocation services, you allow an outside company to host your server. This can mean using your existing server, or if this server lacks the necessary capabilities to suit your needs, purchasing and building a new server for hosting your website and internet services. It helps you prepare for disaster by creating data redundancy. Reduced Costs for Bandwidth Usage: The main reason that many businesses choose colocation services is the ability to obtain higher bandwidth speeds at lower costs than can be achieved in house this is because of the expensive cable and component requirements that are necessary to achieve high speeds. Better Outage Protection & Less Down Time: Colocation services take precautions to avoid any server downtime. This includes using reliable backup generators and other equipment. Company Ownership of the Server & Hardware: When utilizing colocation services, each individual company owns their own server. Therefore, if you decide that you want to upgrade your equipment, you still have the freedom to do this and you are not limited by the servers offered by a hosting provider. Improved Server Protection: Colocation services offer improved server protection from disasters, fires, or theft. 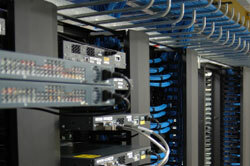 Additionally, many colocation providers can also offer network security and management services as well. Sever Management and Maintenance: For smaller companies that do not want to deal with server maintenance or management, many colocation services also offer server management services to handle updates, manage security and virus protection, and overall prevent any server problems. Cloud hosting is the term used to describe an innovative format for web hosting services. This hosting approach eliminates the problems of being limited by your server and essentially allows your server capabilities to change as needed. With cloud hosting services, you pay based on actual resource usage rather than paying for expensive servers and hardware as with typical hosting or colocation services. Because cloud hosting is an affordable hosting alternative, it is becoming popular among many small and mid-sized businesses.